For the first time since the 2005-06 season, Harvard tied both games in a single weekend, staging a comeback against Brown to equalize the Bears 3-3 and holding Yale to a 2-2 draw. The pair of ties more than a decade ago also came in February against Yale and Brown. Saturday’s Yale game marked the third consecutive game - and fourth time in the last five - that the Crimson has taken to overtime. After coming off a tie at Brown on Friday, Harvard traveled to New Haven to face age-old rival Yale. To open the second period, an offensive flurry saw the Crimson net one and the Bulldogs two, locking the score at two. 39:02 would elapse from the second Yale goal until the end of the overtime period, but neither team would find the back of the net again as the scoreline settled with a 2-2 draw. Having jumped out to a 5-0 against the Bulldogs the last time the two teams met, Harvard would look to start Saturday’s contest with the same intensity. The Crimson did, in fact, score first. Receiving a D-to-D pass from freshman defender Kyra Willoughby, senior defender Kaitlin Tse rifled a shot along the ice and towards the net front. On the puck’s path to the net, sophomore forward Becca Gilmore managed to deflect it past Yale senior goalie Kyra O’Brien. Although the rest of the first did not see any more scoring, the first six minutes of the second featured 75% of the tallies on the day. Evening the game at one apiece, Bulldog junior defender Saroya Tinker converted off of passes from senior defender Julia Yetman and junior forward Sophie Veronneau. Taking its final lead of the day, Harvard would strike again 4:36 into the middle frame. From the point, sophomore defender Emma Buckles launched the puck wide and off the end boards, but co-captain and forward Lexie Laing would opportunistically seize the loose puck for a centering pass to junior forward Kat Hughes, who made no mistake on the finish. The Harvard lead, however, would only last for 1:22 as Yale would knot the game at two with Bulldog freshman defender Emma Seitz beating the Crimson freshman goalie Lindsay Reed. Little did the two teams know that scoring would be done for the day. A large reason that the scoring subsided was indeed Reed, who turned away 37 of 39 shots on goal. Harvard only pieced together 16 shots on the frame, finding itself in a shot deficit in another game this year. 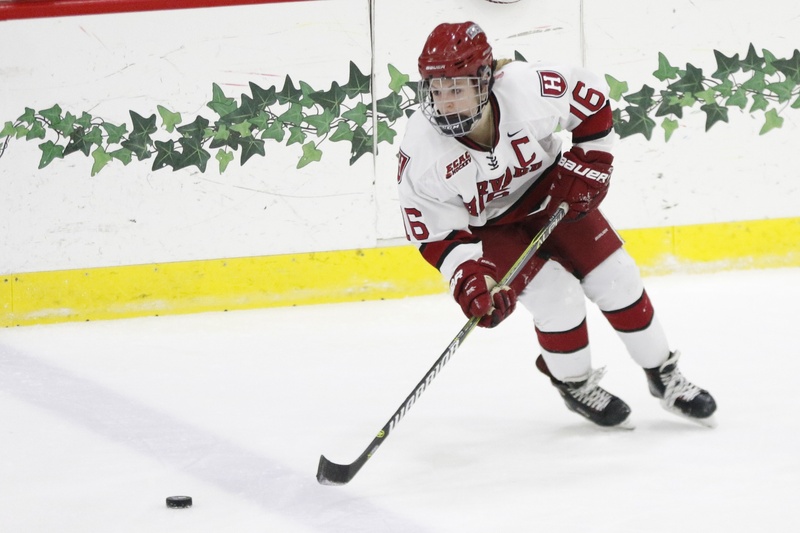 Nonetheless, the offensive efficiency of scoring twice on just 16 shots while also staying penalty-free for the game could be building blocks for Harvard as it looks forward to its playoff matchup against the Colgate Raiders next weekend. After shutting down Brown 4-0 earlier in the month, the Crimson trekked to Providence for its penultimate match of the season. The Bears would prove hungrier for points at home. A flurry of action in the third defined what would be an overtime tie. Entering the final frame of regulation trailing 2-1 and coming off a period that saw Brown outshoot Harvard by 12-3, the Crimson needed a rapid response to emerge with points and secure a solid ECAC standing to enter the playoffs. Twenty-two seconds into the third, Hughes delivered. Collecting a pass at the right side of the crease from Laing, Hughes went for the net, squeaking it by the goalie. Less than a minute later, the Crimson struck again. After dropping the post-goal faceoff, Harvard regained control of the puck. Senior forward Bradley Fusco dished a puck to co-captain Kate Hallett, who put another in for the Crimson to give Harvard a brief 3-2 lead. Then, for the third time in 1:56 of play, another goal - this time from the Bears. Senior forward Abby Niewchas captured her own rebound, bopping it in for a score to knot the game at three, the score at which it would remain. The final five of regulation saw four power plays - another tie with two apiece - but no scoring, as both team’s penalty kill units went perfect on the night. For the second time in two games, the Crimson headed to overtime. Harvard’s defense-oriented strategy worked, and the Crimson emerged with a point to continue with forward progress toward the playoffs. The game had opened with a level of energy upstaged only by the third period’s start. After evenly-matched play for the first few minutes of the game, Harvard found Brown ice. Laing went to the faceoff circle and - as has been her modus operandi this season - won, sending the puck straight back to freshman defender Kyra Willoughby. Crimson clustered around the crease, perfectly positioned to capture a rebound. There was no rebound necessary. A wicked Willoughby wrist-shot from the point zipped along the ice, through a lunging goalie, and into the back of the net for the freshman’s first collegiate goal. Harvard dominated the remainder of the period, outshooting the Bears 13-6. Then, with 15 seconds left before heading to the locker room, a shot by Brown sophomore Kaitijane Blumberg bounced off junior goalie Beth Larcom. Junior Sena Hanson collected the puck and tapped it past with 12.7 seconds left on the clock. The parity would continue. A diving save by Larcom eight minutes into the second, followed closely by a tumbling stop that nearly sent her into the net, would keep the line even. The Bears would score again to take the lead in the second before the Crimson responded with two of its own to open the third. The Bears tied it up just over a minute later. One, two, two, one. The mirror image complete, no more goals were needed, and the game finished in a reflection. Harvard returns to action on March 1 at No. 9/9 Colgate (21-8-5, 15-4-3 ECAC) for the ECAC Quarterfinals at 6 p.m. This marks the third time in four years that Harvard faces the Raiders in the ECAC Quarterfinals. The best-of-three series continues on March 2 and - if necessary - March 3. Harvard dropped both regular season games to Colgate, going down 1-0 in October and 4-2 in January.